Among many antique images in the album, one showed my great-great-grandfather, Andrew Jackson Miner, and his brother Ephraim and their wives. The photo is mounted to a cardboard backing, and surrounded by bric-a-brac designs, portraying the couples in a studio setting. As Andrew died in 1921, I estimated the picture to be at least 50 years old; probably much more. He was bald and had a floppy, walrus-like mustache, while his brother Ephraim had a head of white hair in addition to a white mustache and beard. The look on their faces was stern. I knew that Andrew had lived in Washington, the town where our reunion was held, but the rest was a mystery. Many were the afternoons when I came home from school and studied that picture -- faces, posture, clothing -- wishing I could have known them and asked about their lives. I daydreamed about their voices and what they would have been talking about as the shutter was being snapped. 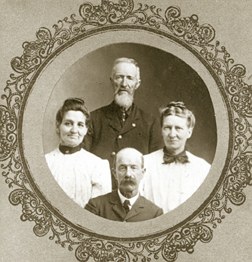 I asked several great-aunts and uncles about the people in the photo, but they all had been very young when Andrew and his wife died, and didn’t remember very much. The craving to learn about these relatives grew, but it wasn’t until reading Alex Haley’s Roots that I discovered how to start in such places as libraries with old census records, books and newspapers and in courthouses with deeds and other legal records. 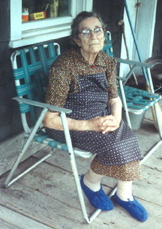 After the death of my grandmother Monalea (Ullom) Miner, in 1977, I found some old family papers in an oak box while cleaning out her root cellar. I learned that my ancestor Andrew was born in the farming village of Kingwood in Somerset County, Pennsylvania. My mother took me to the Carnegie Library of Pittsburgh, where we found old census records showing that Ephraim lived in the Kingwood area as an old man. The following summer, in August 1978, when I was 17, I took advantage of an opportunity to satisfy my curiosity. My brothers were at a summer camp in Ligonier, not far from Kingwood. On a Sunday drive to pick them up, I persuaded my parents to take us on to Kingwood, to see what the countryside looked like, and perhaps to find some old graves of long-lost Miners. My father agreed to my request, and after carefully checking a map, drove us to the very small town. Dad stopped the car at an old stone house to ask for advice on where to find cemeteries. An elderly gentleman, Forrest Hall, came to the door and offered his help. I mentioned Uncle Ephraim’s name, and Mr. Hall proceeded to smile, saying to my astonishment that he had known Ephraim, and that there were Miner relatives living nearby. He said that as a boy he had to shout loudly at Ephraim when talking because the old man’s eardrums had been deafened by the roar of Civil War cannons. 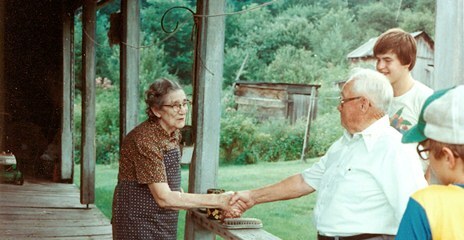 Mr. Hall told us that Ephraim’s daughter was still living, at age 86, in her father’s farmhouse in a nearby hollow. He offered to ride with us to her place so that we might meet her. I could scarcely believe that an actual flesh and blood relative -- and a Civil War veteran’s daughter at that -- was still living in 1978, and my imagination raced with excitement. We accepted the offer. The route turned off the pavement down the steep, narrow dirt “Hexie Road,” and led to a clearing with a barn on one side of the road and a two-story, green weather-boarded house on the other. After we parked, Mr. Hall led us to a side porch, and after calling into her through an open screen door, introduced us to a very tiny, delicate elderly lady named Minnie Gary. She was nearly blind and had been cooking jelly on her wood stove, despite the stifling hot August day. With typical forethought, my father had his camera in hand and began taking photographs. I shook Minnie’s hand and told her that my great-great-grandfather was Andrew J. Miner. “Uncle Andy!” she exclaimed. Without hesitation, she invited us inside, and we spent the next half-hour sitting in her kitchen, hearing stories about her father and his Civil War experiences, and of his brothers and sisters, all of them long dead. Although she could not see, her mind was alive with sights and sounds of people she had known, including her beloved father, who was born 150 years earlier. It was at that precise moment that I first heard the voices of family history come alive, and my search for Uncle Ephraim began in earnest. While I never saw Minnie again, I devoted much of my spare time over the ensuing decades to researching the life of her father, his siblings and parents. I met many of his grandchildren and great-grandchildren, in their homes and at family reunions, recording as many of their recollections as I could scribble on paper. At some point in the mid-1990s, there were so many offshoot branches of the family that I decided to “shoot the moon” and find as many of them as I could, everywhere. The paradigm changed from tracing backward in time to exploring forward, from back in the long ago to today. As of this writing I know of the existence of nearly 2,000 of Ephraim’s siblings, aunts, uncles and cousins, all born by the year 1900, descending in the genealogical tree from Ephraim’s great-grandparents, Jacob and Maria (Nein) Minerd Sr., pioneer settlers of Southwestern Pennsylvania in 1791. To my amazement, I discovered that there many well be 50,000 cousins alive today, and that the family surname today has many variations, primarily Minerd, Minard, Miner and Minor. Another remarkable learning is that Ephraim was just one of more than 100 relatives (including spouses) to provide military service during the Civil War. When the Internet was invented in the 1990s, I grasped that the new technology would be a perfect venue for publishing my research findings to share with everyone, and as a tool for attracting the interest of tens of thousands of distant, line-minded cousins, to broaden our collective knowledge and deepen our understanding. So in May 2000, I launched the Minerd.com website, filled with biographical and feature pages loaded with names, keywords and photographs, and with each bio linked to bios of parents and children for easy navigation. In 2003 it was named one of the top 10 family websites in the nation by a national genealogy magazine, Family Tree. Each Minerd-Miner soldier and relative mentioned in this book has a more detailed biography on the Minerd.com website. As I wrote in Pittsburgh Quarterly Magazine in 2008, on the 250th anniversary of the founding of Pittsburgh, Minerd.com is intended to protect and preserve a fragmented family history and culture against the ravages of time and erosion of memory, public disinterest, destruction of interpersonal relationships and dispersion of families. When I too often hear of families breaking apart, I realize this website is an unprecedented way to re-connect everyone and to educate cousins and their families that regardless of where they live today, their ancient, unbreakable roots are here in the region. In my search for Uncle Ephraim and the family at large, I have had the privilege of walking where he walked and viewing some of the very sights that he saw, on the battlefield and in the mountains of home. This rare experience has provided me with a profound appreciation for the self-sacrifice that he and his soldier-friends made for a country they barely knew when they enlisted but which they discovered in person during the fire and sweep of their wartime journeys.